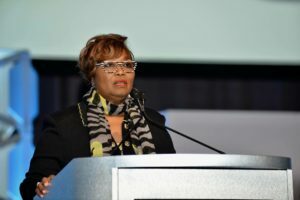 Memphis, Tenn. (October 24, 2018)—Beverly Robertson has been named the interim president and chief executive officer of the Greater Memphis Chamber by the Chamber’s Board of Directors. Robertson will officially step into that position on January 2, 2019. She is building on the legacy left by Phil Trenary, who passed away on September 27. She will be the first female president of the Greater Memphis Chamber. Robertson is a Memphian born and bred. She worked at Holiday Inn Worldwide for 19 years in a diverse range of positions. Upon leaving Corporate America, she was asked to become interim executive director of the National Civil Rights Museum and ultimately spent over 17 years as museum leader and president. She raised over $43 million during her tenure and built the annual Freedom Awards to global prominence including visiting President Nelson Mandela in his South African home to personally appeal to him to attend the ceremony. She helped lead the museum to world-class status, becoming accredited by the American Association of Museums, being voted one of the Top Ten Treasures in America by USA Today and one of the World’s Top 10 Most Iconic Sites. Robertson completed the Executive Leadership and Management Graduate level program through the Wharton School of Business at the University of Pennsylvania and she completed the prestigious Getty Museum Leadership Institute in Los Angeles. She serves on a number of community and national boards and works with a diverse range of nonprofits across Memphis and the surrounding communities. She and her husband have three adult children and one granddaughter.